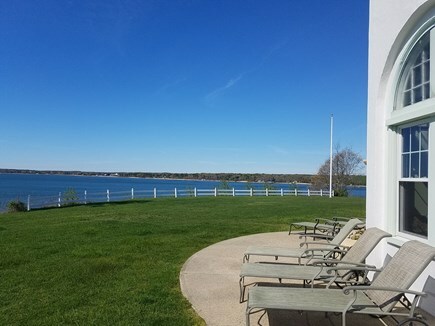 Our waterfront estate on the Chatham line in South Orleans features 300 feet on beautiful Pleasant Bay, where it has been a landmark to the area for 100 years. 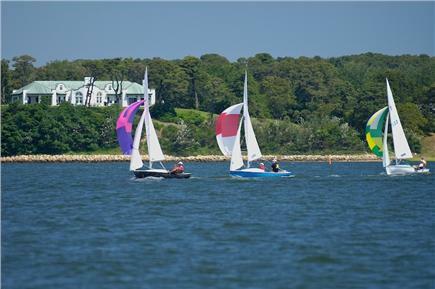 It was chosen by Cape Cod Life magazine as one of the top places to rent on the cape! 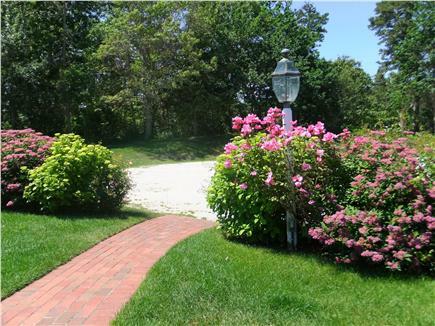 The house sits on three acres on a peninsula overlooking the Bay, Quanset Pond, Chatham, Nauset Beach, and the Atlantic. 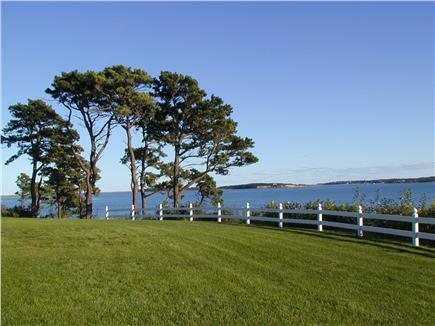 The extensive lawn, with underground sprinklers, offers plenty of room for fun and sun between the 17 room house and the bluff and beach. A pathway leads down the bluff to the beach. The water is warm and calm. 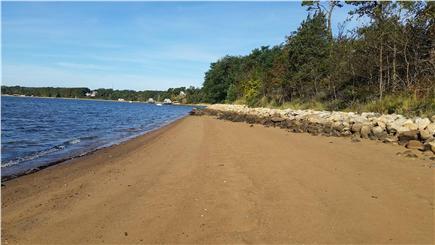 There is a deep sandy beach at low tide. This gets covered by the high tide, but there is a deck to sit and enjoy the sun and watch those swimming in the water, the kayakers, the paddleboarders, or just enjoy the view. 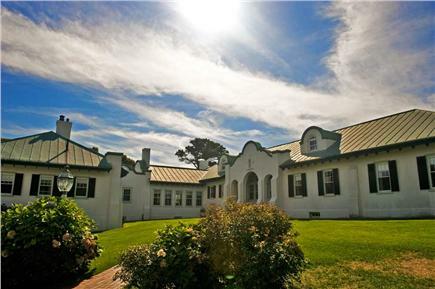 The estate is at the end of a private road - far away from any traffic and noise.The house offers plenty of room for everyone to gather together or to find some private space. 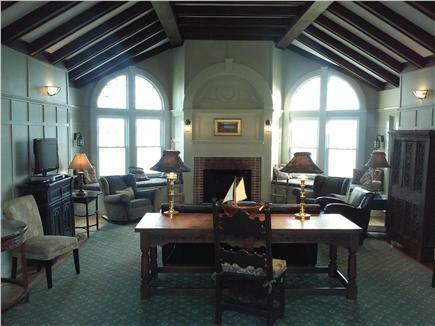 The 17 rooms include 9 bedrooms, 5 and 1/2 baths, and 3 fireplaces. One bedroom has a king sized bed.Three bedrooms feature queen sized beds. The other 5 bedrooms have sets of twin beds and one has 3 twin beds. The bedrooms provide sleeping for 19 people. The nine bedrooms are really nine bedrooms - not common rooms that become bedrooms at night with pull out sofas. There are no sofa beds, futons, trundle beds, bunk beds or cots. Everyone has a personal and private space. 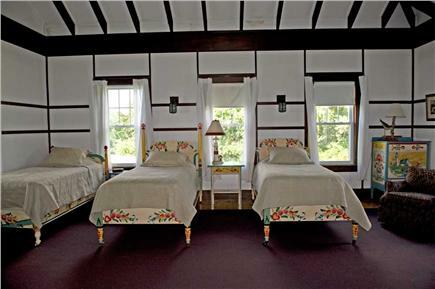 All of the bedrooms have twins beds, queens and one king. The second floor as well as two wings of the house are air conditioned. All bedrooms plus the family room and dining room have A/C. 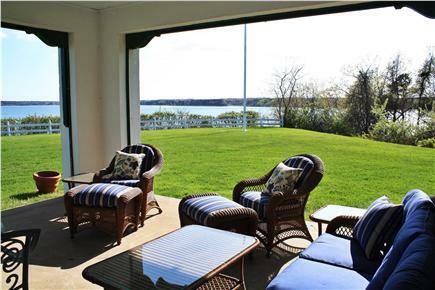 The waterfront side of the house with a southern exposure features a large sunroom with sets of sliding glass doors, several porches, and a large terrace. 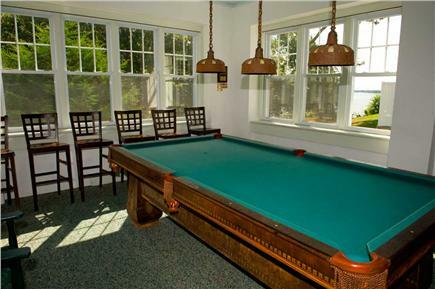 The game room is a popular gathering place with a pool table and dart board. There are 2 living rooms each with a TV, VCR, DVD, and wireless internet access. The main kitchen was remodeled in 2001 with Corian countertops, a Sub-Zero refrigerator, microwave, dishwasher, disposal, ice cube maker, etc. 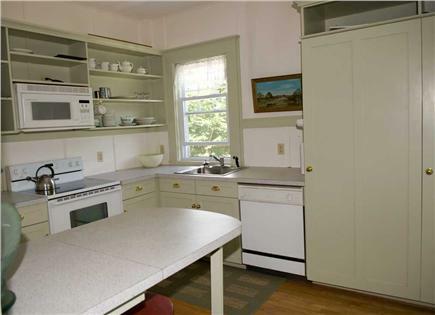 The former servants wing has an additional modern kitchen that is equally fully equipped. There is a separate laundry room with washer and dryer. Everyone enjoys the fully enclosed outdoor shower. Beach, bed and bath linens included. No cleaning fee or taxes or hidden fees. The estate is available for families, for groups, and for special gatherings by the week from June through September and by the week and week-end in the off season. The house is closed for the season after Thanksgiving and reopens in April. There is a mooring available to bring your boat. 17 of the 19 rooms are on the first floor. The house is handicapped friendly. Our 2nd wedding at this beautiful property!! On October 7, 2001, I got remarried at Gentle Heritage because it had the elegance and natural beauty that felt like the perfect match for the day that my fiancé said “I do” to me and my two young children – who were our Maid of Honor and Best Man. Seventeen years later, on October 7, 2018, my daughter chose Gentle Heritage again for her wedding day. She always remembered the fun she and everyone else had at our wedding, and wanted to recreate that for her day. It did not disappoint. We had 12 staying at the home, the weather cooperated, and the vendors were fantastic. If you use vendors that are familiar with the property, it makes everything go that much easier. The back kitchen was very handy to prep food and store excess refrigerated items. 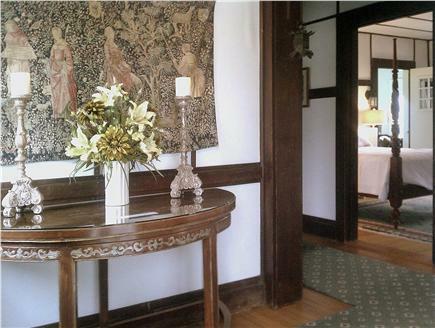 The owners renovated in 2010 and added another ½ bath to the property which was helpful the day of the wedding. We spent leisure time at the expanded sandy beach in the front of the house and enjoyed corn hole games in the backyard. Ken and Ginger are prompt in responding to your questions before and during your stay. They have another home as you approach Gentle Heritage and were staying there during our visit. I highly recommend this property if you want to create a memory that will truly impact you for a lifetime. Beautiful memories for my daughter's wedding! We had the honor of hosting my daughter's wedding at the Winslow Estate's Gentle Heritage, and what a backdrop it provided! 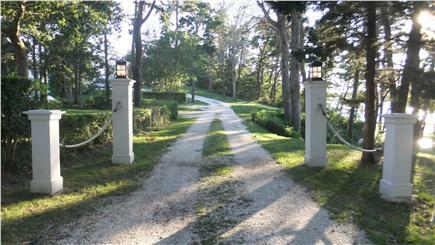 The bridesmaids and family stayed in the home for the week, while the groomsmen stayed at the property's Bay House. What a perfect situation! There was room for all, and it was so great to all be together as we approached the wedding. We held the wedding in a tent overlooking the magnificent view. Our guests were just awestruck. Everything went off without a hitch! Ken and Ginger were right there when we blew a fuse (ten bridesmaids, lol), helped with parking, and Ken even drove the bride, groom, and photographer down to a beautiful setting in his golf cart! They were helpful, yet utterly unobtrusive...you truly feel that this is your gorgeous home for the week. This is a very special place not only to have a beautiful wedding, but to experience a loving week around your wedding with the people you love most. We found the house perfect for our taste and magical: it is beautiful, grand and special, but it still has a bit of a salty Cape Cod feel to it and it’s not overly opulent or stuffy. We and our guests felt comfortable and found it easy to make it home for a week. Our two families, one from Montana, the other from Cape Cod, piled 16 of us into the house beginning the Wednesday before our wedding and departing the Wednesday after the event. This gave us some special time to spend together before and after our day, and to properly prep and break down without the feeling of chaos that comes with having too little time. Our nephews spent most of the week on the beach below the property’s bluff, our brothers shuttled us and friends on boats in and around Pleasant Bay, our parents sunned and drank wine on the patio, and all of us cooked meals together throughout the week. At some point we lost count of the champagne toasts. There is plenty of room for both groom, bride, family and friends to get ready here - you really create your own personal castle around your day. 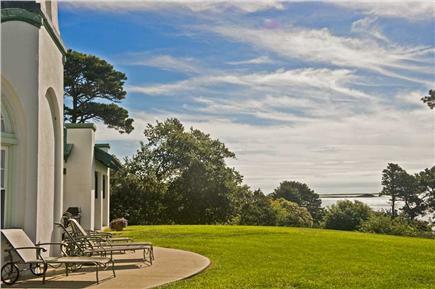 We also rented The Bay House next door, which we found to be the perfect accommodation for our wedding party (though accommodating other family or guests there would work great, too). The pictures are accurate but the view is really better than one can capture. We were lucky to get a sunny day, but this property would be beautiful in any shoulder season weather. Couples considering the property should be ready to coordinate the moving pieces of their wedding, or hire a planner to do so. The choices for tent rentals, caterers, and beyond are endless and we found that the charm of renting here is that you can really put your fingerprints on your day, but it does mean keeping an eye on many moving pieces (we really liked this part, but it’s not for everyone). We did all the details ourselves but hired someone to take over a few days before so that we could really enjoy. The nice thing about having your wedding here though, is that there is more than one way you can have your day and that is great for different tastes and budgets. Ginger and Ken are wonderful hosts, and if we could impart any advice to those planning to have a wedding here, it would be to make sure you understand the rules and guidelines that they give you; they are all for good reasons and all important, but for a stress-free week, knowing all of these ahead of time is very helpful – and they are clear about almost everything ahead of time. Ginger answered our questions thoroughly and quickly during the months we planned our day. This is a unique and very special place for an event, and we are grateful to have had our wedding here and will remember it forever. And, you and your family were most welcome guests. Thank you so much for taking the time to let others know about your vacation with us on Pleasant Bay. We hope you will return. Our family celebrated our parents' 60th anniversary at this beautiful and unique home. With plenty of places to relax and take in the views thoughout the day and in the evenings, the setting was just perfect and for everyone it was a memorable week. Great thanks to our hosts/owners the Winslows, who were very welcoming, helpful and eager to offer ideas for dining and recreation. We loved our stay in this special home and hope to return! To call the Winslow Estate spectacular doesn't even do it justice. I can only describe it as a little piece of heaven on Cape Cod. Everything was as promised, and Ken and Ginger were terrific to deal with. I held my daughter's wedding reception on the property and can't begin to tell you how happy we are that we did. Booking from Wednesday to Wednesday gives you time to settle I and time to relax after the event. Seventeen family members ages 16 to 82 gathered for a reunion. We came from Paradise Valley AZ, Mission KS, Austin TX, Overland Park KS, Key West FL and Evergreen CO. Only one person had ever been to Cap Cod. As the event planner, I worried if the property would accommodate us comfortably; it did. We sometimes went our separate ways during the day visiting many interesting nearby places. Afterwards we looked forward to our big meal together, at what we all called home. Family members took turns cooking meals. 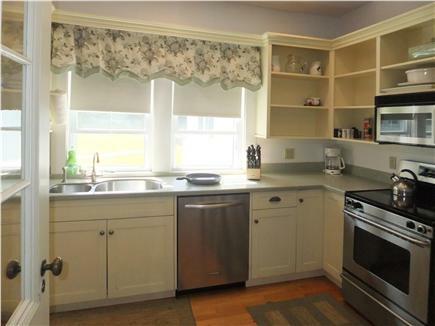 With two kitchens there was never a problem with storage or work space. My contribution was a lobster dinner. The owners suggested I get steamed and cracked lobsters from the Nauset Fish Market and then just warm them up on the outdoor grill. We prepared delicious side dishes. Thanks to my son-in law's foresight, he stopped at Costco, located near Logan Airport, before arriving. I had him choose some nice red and white wines for the dinner. They were reasonably priced. Those who were 55 and younger enjoyed hiking and biking. All of us enjoyed going to Provincetown whale watching. We saw 5 whales at one time. The JFK Museum was interesting. It’s small and easy to get through. Wherever we went, we found nice places for lunch. It was memorable being in such a historic area on the 4th of July. That evening, from the patio, we watched the fireworks across the bay. I’d been told by the owner we would have arena seats. Their private beech offered much joy when everywhere else was crowded. The perfect spot for a group retreat/getaway!